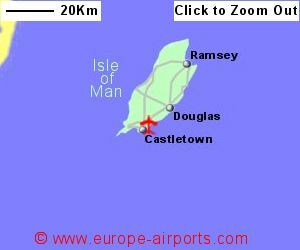 An hourly (half hourly during peak times) bus service connects the airport to Douglas, the islands capital, Castletown and Port Erin. Taxis are available, and the trip from the airport to Douglas should cost approximately 20 pounds. The airport also has a request stop on the Isle of Man Railway, a narrow guage steam powered service. 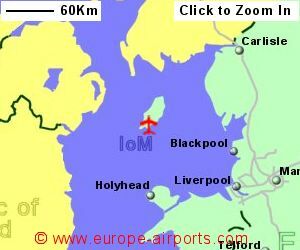 The Isle of Man airport has 3 cafes/bars, 2 shops, 2 cash machines, FREE WiFi Internet access, a meeting room is available, plus Fax and photocopying on request. 797,000 passengers were handled by the Isle of Man airport in 2017, an increase of 1% from the previous year.